Three years ago, the German demoscene group, Still, was releasing an experiment at shaping some of the work of late painter Victor Vasarely as animated figures in a tribute demo: Beta. The unusual style from a demoscene standpoint, extrapolating what his work would have been if it were animated, was a success. Last week Still released another demo with a similar geometric style and a brilliant direction: Intrinsic Gravity. 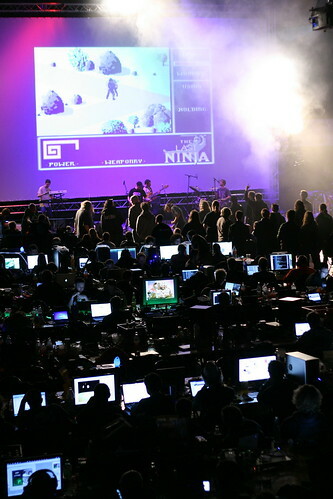 It serves as an invitation to the demoparty NVScene, to take place in San Jose, California, this March. I recommend you these two demos, they are a pleasure to watch. This is a long due post, but I have been busy recently and couldn’t take the time to write a proper party report. Later being better than later, here are a few words about the third edition of the Japanese demoparty, Tokyo Demo Fest, which took place in the center of Tokyo a month ago. This party is still very young. When the first edition was launched, it was a one day only event, had under 50 visitors, and I understand it took place in what seemed to be a meeting room they rented. The demoscene culture is something very little heard about in Japan, so kudos to these enthusiasts for organizing it. I wasn’t part of the team yet, and joined them a few months later, with the hope I could bring a European point of view and some of the experience from organizing Prologin for eight years (a French thing, most likely you’ve never heard of it; anyway it has a few points in common with demoparty). 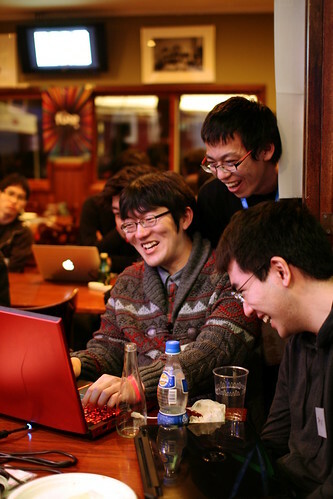 The next edition was organized in a club in Akihabara which, while being way too narrow and not suited for coding sessions, certainly allowed to have a better party feeling than a cold meeting room. Around 80 visitors attended. Then we went onward to the 2013 edition, with more experience and more expectations. And for some reason, many things went very well. 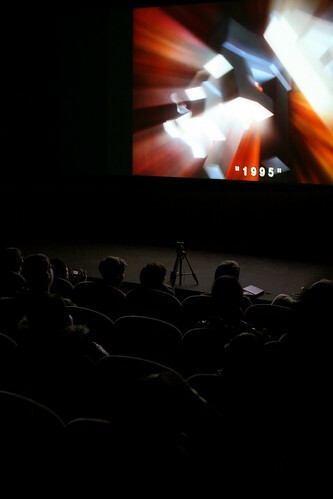 The invitation intro, released at Function, won the PC 64k Intro Competition. Various sponsors supported us, including last minutes ones, securing us both on money and equipment. 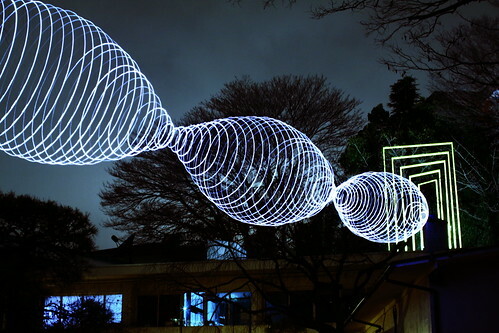 We met with the Institut français de Tokyo (a public funded cultural institution) and agreed on organizing the party in their buildings, as part of their event “Le mois du numérique” (“The Digital Month”, which had Éric Chahi as a guest star by the way). Suddenly, Tokyo Demo Fest had grown up from a nascent demoparty wannabe, to a full featured demoparty, with a warm party place wide enough for over a hundred visitors, seats and tables, real equipment (audio, video, light, network…) and other fancy stuff like an actual theater room for projections and seminars. But then there was one problem left that wouldn’t be a matter of infrastructure: the mood. Would the audience participate? Would we have a real party? From my European point of view, it seems to me that Japanese people have a very hard time being spontaneous, and I understand it is somehow considered inappropriate in the Japanese society to openly show your emotions. They would watch a competition staying quiet and silent, only to give a contrived applause at the end, light years away from what we may experience in Europe, with people shouting and whistling on every bit they like. How to get this to work here was the big question, and the Japanese organizers who had attended other demoparties and experienced this uplifting feeling of being part of a crowd enjoying the event, were wondering too. Well, I don’t know what happened. I don’t know if it’s a matter of reaching a critical mass, the opening icebreaker talk by Kioku (the lead organizer), the party place, the productions, or because we had many western visitors who by their behavior became the sparkle that would ignite the fire, but the atmosphere we had was a complete blast. 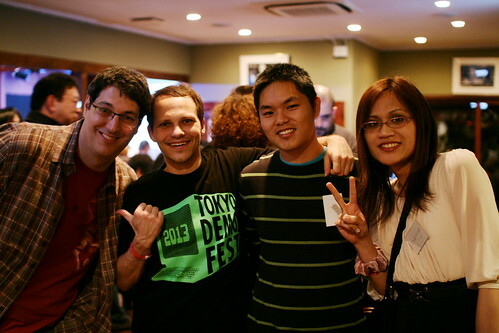 That was it: Tokyo Demo Fest was now a solid demoparty, a mix of Japanese and European spirit that worked. I invite you to read this party report by Setsuko Hyodo for a more in-depth description. Finally, on top of the cupcake, was the cherry. If you ever attended a small demoparty, you probably know the level of the releases is not going to be outstanding. Let’s face it, as fun as competitions are in such parties, you can consider yourself very lucky if you get anything, say, worth watching for people who did not attend. So how lucky exactly are we supposed to consider ourselves when we had for example a demo like Artifacts by IllogicTree (winner of the demo competition, and given how it was received outside the party, it is a good bet to say it is going to be one of the best demos of 2013), an artwork like Jade by Offwhite or a music video like ATOM – Galaxy Man by In-Sect?